Heather Tarr reporting as Ric is on holiday. As we started the tide was running with us (West) but by the end it was running the other way in the main channel and running South in the small boat channel. Wind SSW, a spinnaker start then a beat to North Sturbridge and those that tacked early did better. A spinnaker run to Gleeds but as the wind died Crazy Horse, Danegeld, JJT, TT and Kurketrekker retired. Happy Apple chose the small boat channel whilst Sunshine and Kudu tacked out. For a while it went very light and there was a real chance that no one would finish. Thankfully the wind filled before the tide could push the remaining three boats back too far and Sunshine took line honours but Happy Apple stole the day. Thanks to all and to HSSC for providing the bar and food. The Sailing Instructions for this years Offshore race from Plymouth to St Peter Port are now available Sailing Instructions for this years Offshore race from Plymouth to St Peter Port ..
Whilst half a mile inland all was sunny and warm arrival on the Solent coast brought on shivers in the cold very murky fog. As the yachts gathered their teams ready for the sail to .. Despite the cool north easterly it was a cracking evening for a sail with plenty of sunshine and another great sunset thrown in. With the late withdrawal of Jolly Jack Tar with gear .. Cold! How is this Spring I mused as with teeth chattering amidst a crew yawning competition we took the long low water route to Gilkicker. 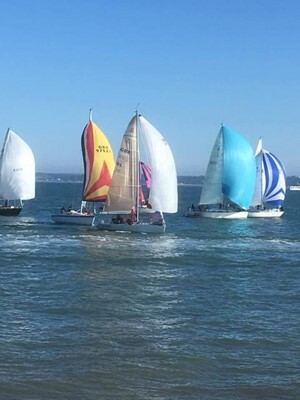 Things perked up a bit once we were in the ..
Plymouth Branch organise 3 of the 5 races that make up the Ullman Sails Offshore Series organised by the Port of Plymouth Sailing Association. The races to St Peter Port, Roscoff and ..